Happy New Year! With the start of a new year, we tend to start something new, a new workout plan, a new diet, a new set of something or other. For me, it’s low-carb recipes. For the next 3 months, I will be featuring recipes that are keto, paleo, and low-carb friendly. 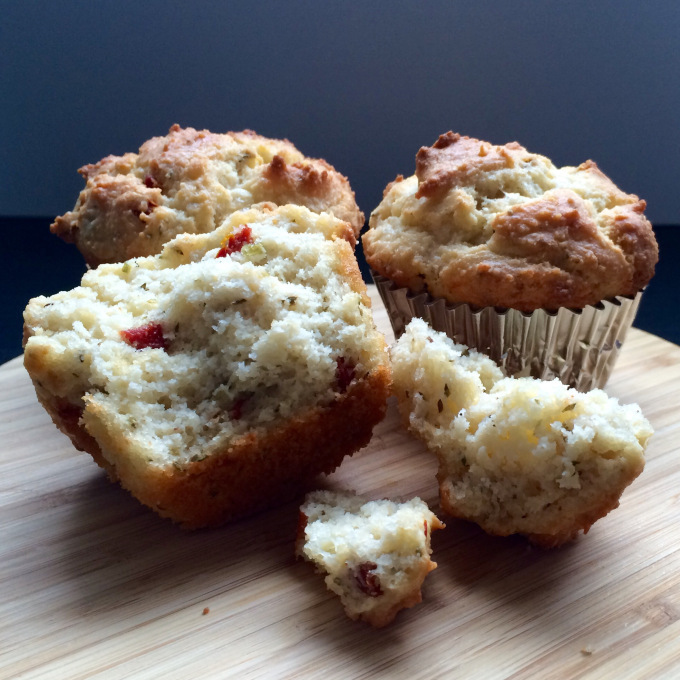 I started off making these muffins with lots of herbs then added some ingredients you’d put in a pasta. The flavours in this one are so good. Very Italian! In a large bowl combine almond flour, salt, baking powder, garlic powder, oregano, sun dried tomatoes, and cheese. In a smaller bowl melt the butter in the microwave, about 30 seconds. Add sour cream and eggs. Mix well. Add the wet ingredients to the dry, mix till combined. Stir in the parsley. Spoon into a lined muffin tin. These muffins freeze well, and should be stored in the fridge. I will most likely be posting more variations of these buttery muffins but you can always change the cheese and herbs to make it your own.